This early morning, heavy rains poured non-stop... and one of the perks living in certain unlucky parts of Marikina is that you can get an instant river right at your doorstep courtesy of the floods. Good thing the rains stopped and the sun appeared. Nevertheless, these flash floods don't subside immediately cause we still have to wait for the rains from our very generous neighbors, Montalban and Antipolo for their residue to rage down the Marikina Valley. Here are some long-range shots of the floods nearby. 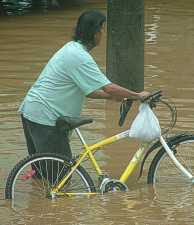 You could guess by the bicycles in the pictures how deep the water is. As for the picture with the yellow rails, the left side where the guy is walking is a street, and to the right of the yellow rails is a creek at least 15 feet deep. 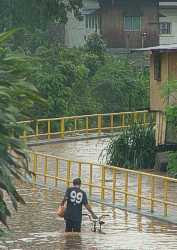 If there were no rails, you wouldn't know if you were walking on the street or heading towards the deep waterway. As long as it doesn't rain for the meantime here and in nearby areas, this flood will subside in 1-2 hours. My problem is that I have to wait before I could get out.